Before the new Nexus 7 was officially revealed, we already knew what specs it would have and how it would look like. 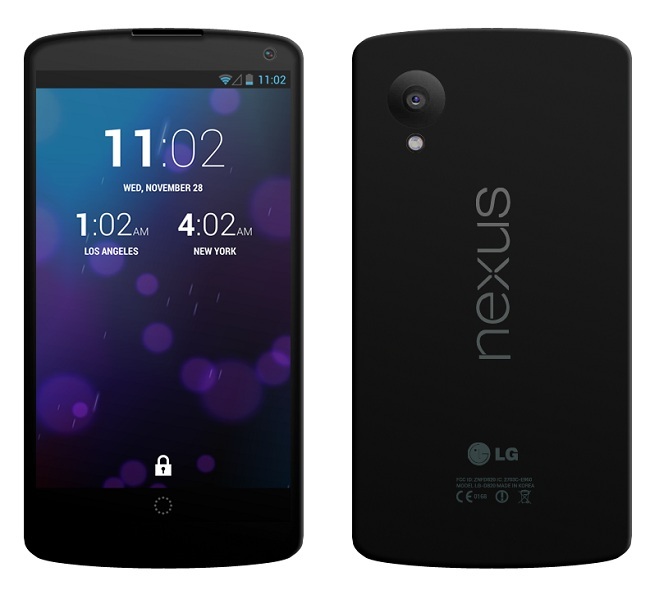 The same thing is probably going to happen with the upcoming Nexus 4 successor – the Nexus 5. The Nexus devices were originally named after their screen sizes so conventional wisdom dictates that we can expect this one to be 5″. All the hype of the upcoming Nexus smartphone started after finding out a person, in the Android 4.4 release video, taking pictures with a smartphone that was never seen before. To make it more interesting, the phone had a Nexus logo on it. Some people say Google accidentally revealed the upcoming Nexus phone but we think this was done in purpose. Google is very careful not to ‘accidentally’ leak out a valuable device. I will bet it was a calculated move to generate interest and buzz. 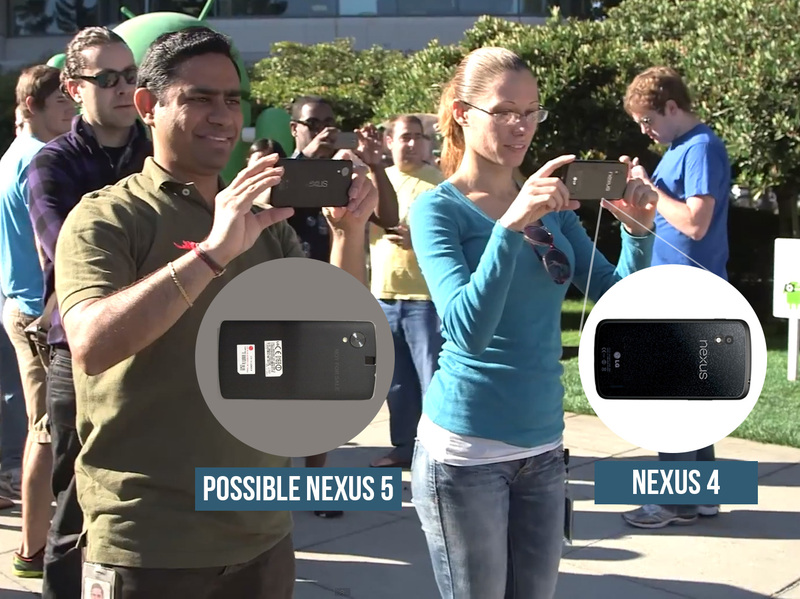 Notice how there is a woman holding the Nexus 4 beside the man holding the Nexus 5. This clearly feels deliberate to show the difference between the phones and establish that a new one is coming. A new rumor suggests that the purported Nexus 5 will be unveiled on October 14th along with Android 4.4 Kitkat. The tipster provided info to the folks at Ausdroid regarding the release date and also on the features on the new Android version. As the Nexus 4 was released on October last year, there’s a high probability that Google would keep the same schedule as they did with the Nexus 7. The picture above is a render of the upcoming Nexus 5 but we are still not confirmed whether this is just a prototype or the final version. 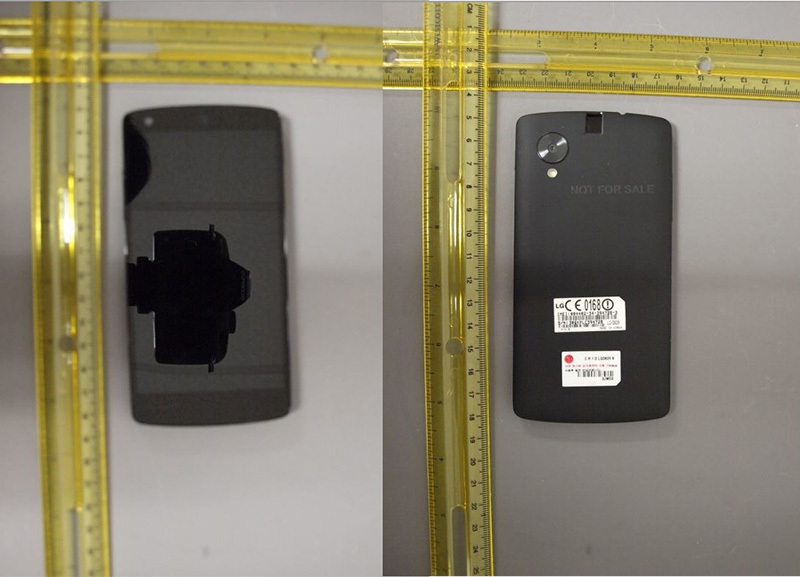 The leaked photos of the Nexus 5 in the FCC shows a similar rear design as the one in the video but with no Nexus logo. Most importantly, there is no logo of the manufacturer. So here’s another question. 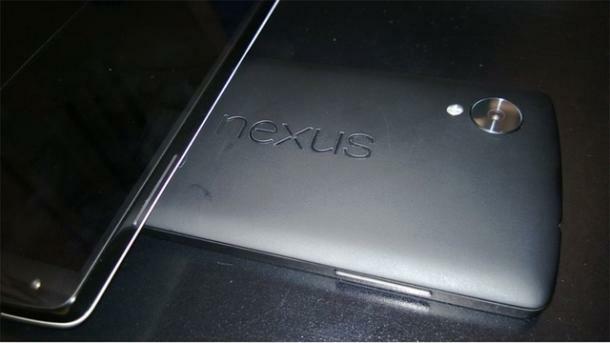 Who is manufacturing the Nexus 5? Sony? LG? or Samsung? According to tipsters it seems like it will be LG once again. Based on all the leaks and infos, Nexus 5 is surely in the pipeline and all we have to do now is wait and keep our eyes open to see an announcement made by Google. Get ready to potentially see more leaks and info in the coming days. Possibility of the event to be shifted to October 31st.